Hello to you! Today I have another dupe/comparison post for you. If you asked me a year ago, what my favorite polish was, I would have said Essie Chinchilly. I LOVE "greige" (grey/beige) nail polish. I think it looks great with every skin tone and it's appropriate for casual, dressy, and work environments. Since Chinchilly isn't the best formula, I am always looking for a dupe. I recently picked up Urban Outfitters "Undercover" and thought it might be a great dupe for Chinchilly - and I was right! Urban Outfitters Undercover is a great alternative to Chinchilly because it's very pigmented and applies very easily. L'Oreal Eiffel For You is also a great dupe, but still not as opaque as Undercover. I decided to throw in Rimmel Steel Grey and Sephora by OPI Metro Chic for comparison sake. Those shades are a bit deeper than the rest, but still beautiful! FYI - The photo below is a little lighter/brighter than the polishes look in real life. I apologize for that. 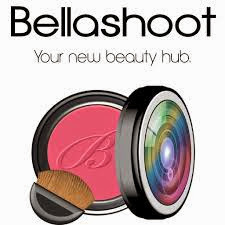 For the photo below, I removed Metro Chic and Steel Grey to show the dupes side-by-side. You may be able to tell from the photo that Chinchilly is a teensie bit cooler than the rest. I asked my daughter Shelby, who is 6, to see if she could tell if all the colors were the same. She studied my nails for a while, and finally picked my pointer and pinky as a little different than the others - Great job Shelbers! Although you can tell if you really study, I consider them close enough. 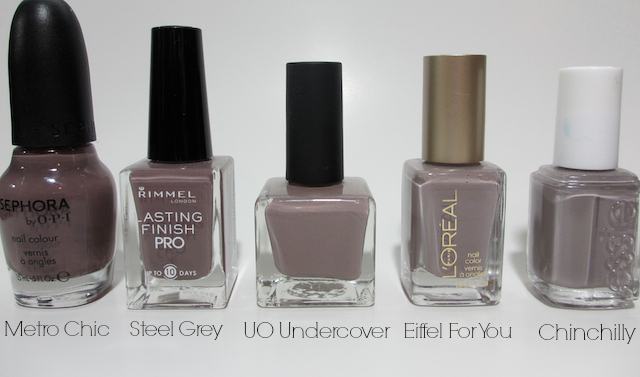 Eiffel for You and Undercover are pretty much exact dupes - minus the application. L'Oreal is still applies better than Chinchilly, but not as good as Undercover. If you have been looking for a dupe for Chinchilly, I highly suggest checking out Urban Outfitters Undercover. I found it in the store, but they also sell polishes online here ($5/each or 2 for $8). Urban Outfitters also sells other brands such as Essie ($9), Butter London ($15), Models Own ($8 - they have the Mirrorball Collection in stock), and I was surprised to see Lime Crime ($6). I hope you enjoyed this comparison post. Let me know if you have any great dupes for Chinchilly! Thank you. I do love them all too! Thank you very much Melissa. Eiffel For You is a great color. But maybe Rimmel Steel Grey would look better on you if you don't think the lighter shades do??? Lovely comparison! All are so pretty. These purple toned greys are just so pretty. I think the Essie is still my fave out of the group though. Great comparison. I think I like the Rimmel best. With all the polish I own I don't think I own any in that color family. i love comparison posts. i am not sure if own chinchilly actually. have metro chic and steel grey for sure. hmmmm. guess i'll have to look because it's very pretty. Oh yes, Chinchilly or a polish just like it, is a must! Comparison posts are the most useful, so *maybe* you don't end up with having 10 bottles of the same colour like it often happens to me xD Chinchilly is beautiful! :) I always appreciate comparison posts, that's for sure. Thanks for stopping by. Chinchilly is hands down one of my favorite polishes. Crazy though, it pulls way more purple on you. Funny how that happens :) Thanks for the comparison! That is weird. It must be skin tone?? :) Chinchilly is pretty cute! Thank you - that means a lot to me! Have a great day. Love these kind of posts! I own two of these (Rimmel and Essie). I bought the Rimmel because it stamps! But I simply love this color! Great comparison! Can I add those to my dupe list? I'll credit you! "dupe" is used by lots of bloggers to show if it can be considered a "duplicate". Just another way of saying it:) Thanks for stopping by! 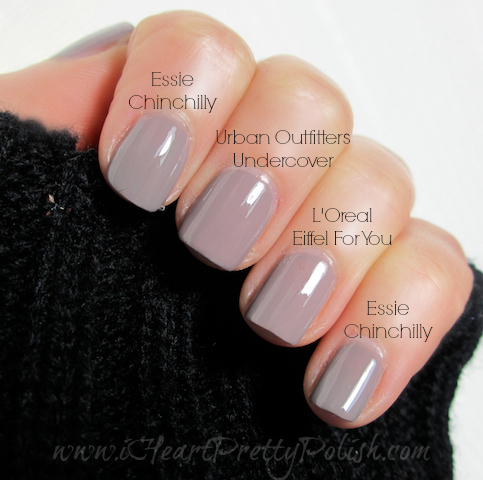 What about comparing Chinchilly to the Essie gel Puffer Up? Thanks!